One of the aspects of beer that really sets it apart from wine is the range of ingredients. I am friends with homebrewers who can’t stand hoppy beers, while others won’t brew anything that isn’t hop forward. While some brewers are out foraging for local herbs to flavor their brews, smoking their own malt, or buying fruit at a farmer's market, others are culturing yeast and bacteria to recreate the funky/tart flavors of wild Belgian microflora. This range of ingredients has resulted in a huge number of styles and examples that highlight the various flavors. I have a pretty open palate. I’m the sort of person who usually orders something new every time I eat at a restaurant, even if what I had the last time was delicious. When it comes to beer, whether I'm brewing or buying, I’m usually looking to experience a new flavor I haven’t tasted before. However, there are certain categories that I often find myself coming back to. My lack of excitement for malt and yeast forward beers stems from the relatively finite flavors of the ingredients that are commercially available. There is a much higher degree of variation between hop varieties than there is for barley (not to mention the new hops coming out all of the time). While processing has a bigger impact on malt character than it does on hops, it has been a long time since I used a new malt that really made an impression on me. Similarly I enjoy yeast-forward beers, but in many of my favorite beers the yeast provides subtle complementary flavors rather than playing lead. All that said, I’m torn on what to pick from the list above, hoppy or sour/funky. I’ve had beers from both categories that at the time I’d have sworn couldn’t be topped. I also have certain flavors in both categories that I can’t stand. There isn’t anything worse than oxidized American hops, unless I’m drinking a sour beer with above-threshold acetic acid (vinegar)! While there are beers I love that feature malt, yeast, spices, or fruit, I don’t like these types of beers consistently or as much as either hoppy or sour beers. The question/options I posed were unfair, as many of my favorite beers highlight a combination of flavors from a variety of ingredients. 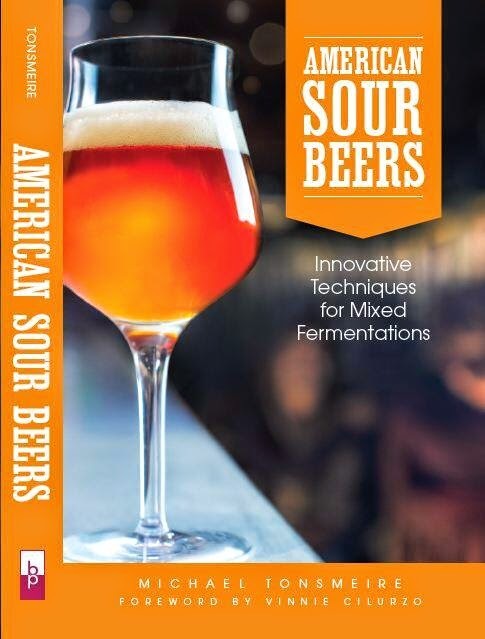 Sour fruit beers, hoppy beers fermented with characterful yeast, malty beers with subtle spicing etc. One combination I’ve fallen hard for in the combination of bright hop aromatics layer onto a sour beer. I’ve done it a couple times in the past, but this blended sour might be the most fun. I had a half keg of our first pull from the wine barrel solera, that Nathan and I dry hopped with Hallertau. The bottles were great, but the kegged portion never tasted right. It was sharply acidic and not especially pleasant. As a result, I cut it with a few gallons of the 100% Lactobacillus fermented Berliner weisse, which never soured adequately. Then I keg hopped the blend with a couple ounces of Comet (which HopsDirect describes as “[U]nique, wild, American aroma, and wonderful zesty grapefruit, lemon, and orange notes”). I bought a pound of the 2011 harvest on a whim, and hadn't found an excuse to use them. Appearance – Rather generic pale ale appearance, a bit darker than yellow. Some haze, although that may just be from the dry hopping. The head is surprisingly good, most likely thanks to the young Berliner weisee. Smell – Strong candied citrus aroma, with some pine as well. A vibrant nose with just a hint at the acidity that lays behind the hops. As it warms I get hints of the wine barrel that housed the older portion for 20 months. Taste – Bright tartness, but not strongly sour however thanks the dilution of the wood aged beer. The hops are bright and crisp, featuring grapefruit zest, and just a hint of Citra-like dankness. The tartness comes across very much like citric acid, sharp but short, not lingering long. Not a super complex beer, but it is still very enjoyable. Drinkability & Notes – Wonderfully refreshing, I only wish I had this on tap when the weather was hotter. The Comet hops are a fun addition, I’ll have to figure out something more traditional to do with the few ounces I have left in the freezer. Comet are delightful. I made a saison that I hopped like an IPA with all Comet, and it was dreamy. While there may be less overall range in malt-forward beers, I find that it's really really hard to do them well. North American breweries in particular don't seem to understand how to properly brew the maltier styles. After going through the BJCP ringer I have a whole new appreciation for a very well-done maibock or a classic Munich Dunkel. Even Pils-forward lagers command a lot of my respect when done well. I'll certainly agree with that. If However just because a style is difficult, doesn't mean it is my favorite (see American light macro lagers). Although, if I could easily get super-fresh Ayinger, Weihenstephaner etc. I might be singing a different tune. I suspect a lot of the mediocre quality issues stem from many American brewers using the same domestic pale 2-row as the base for all of their recipes. There is no replacement for the right high-quality European base malt in those styles! The willpower to leave a beer untouched for almost two years. My god. Climing Denali neeked, with no food, would be easier. I had that problem early, but now I have so many beers that it is pretty easy to keep my hands off them until they are ready. A good pipeline is a wonderful thing! Awesome piece that you wrote, very helpful. I have a Gose brewing, I have it sitting with a half gal of light DME lacto starter that i made. its been a couple of weeks and our pH isnt dropping very fast, we have it in a climate controlled fermentation chamber at 119/120. Planning to add US-05 to finish fermentation. You can see activity happening in the blow off tube. But I'm not sure how long should I wait till it's ready to add yeast. The pH im hopping for is 3.5. Would you give me a hint on How long would it normally take?? much appreciated. What Lactobacillus strain are you using? Lacto is quick. If it isn't sour enough after five days alone in a low IBU wort, it likely will never be. With a good strain 24 hours is usually enough for me!